Please Feed Me | Food blog. Restaurant blog. Recipe blog. Please feed me blog. Sorry for the inconvenience! We are now at chasingjamesbeard.com. Please go there for new posts. We are also in the process of redesign, formatting, etc so please excuse any kinks that might come about. Thank you! My latest post at chasingjamesbeard.com is about Future Foods. 10) Chinese fried shrimp. Where it’s so fried that you can crunch through the delicious head like a potato chip. 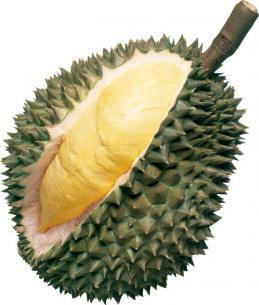 8 ) Durian. It’s a fruit, but is so freaking fattening, especially when you eat the whole damn thing. 7) Stinky tofu. I don’t understand how you can stop yourself from eating this delectable delight. 6) Eating condensed milk straight out of the can. Don’t judge me. 5) Cheez Whiz. HELLO!! Fresh Direct, why do you not carry it?????? 4) Butter. Ask my ex-boyfriends who have put on god knows how much weight from my cooking. 3) Gelato in Italy. Can we please reproduce it in the United States somehow???? And don’t say Grom, Grom cannot compare. 2) Lobster. The meat, the green stuff, the orange stuff. I take pleasure in cracking it all and taking my time with it. 1) Maruchan Instant Ramen. I can eat it all day, all week, all month. Crack an egg into it while it’s cooking and you have a full meal. 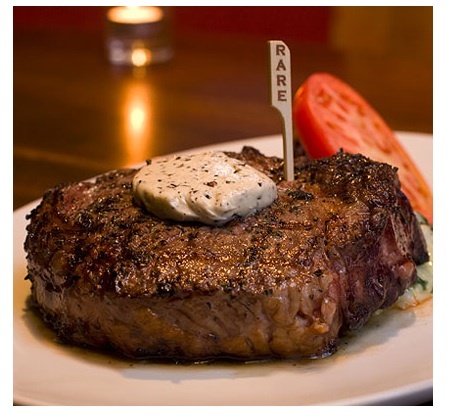 How Does A Medium-Rare Rib-Eye Steak Sound? Walking down the stairs to the dining area of Rare made me realize that they took food seriously and passionately. What made me feel this way? It could have be the word “EAT” spelled out in knives on the wall. OK, it was the word “EAT” spelled out in knives on the wall. After a day of walking a trade show, me and my colleagues were ready to sit down and fill our bellies. Immediately we ordered a round of drinks and my Jameson Manhattan was a thing of beauty. Cold and just the tiniest hint of sweetness, their bartender knows what he/she is doing. I can’t tell you how many places can’t make a good Manhattan. As I sipped my drink I took in the ambience. The room was very empty and I hate to say it, but the décor was quite tacky. And not like so tacky that it actually looks good, but just plain tacky. There was an oversized fake oven at the end of the room that hurt my eyes and barbed wire was printed on the lights and walls. I was hoping that the food would be better. Sustenance started coming to the table and my spirits were lifted because everything looked great. Basket of fries: this overflowing basket came with sweet potato fries, shoestring fries and waffle fries. They were just average, but what made this dish fun were the dipping sauces. They brought over not just ketchup, but chili ketchup, BBQ sauce, honey maple dipping sauce, chipotle aioli and a garlic aioli. The garlic aioli tasted like a high class version of Papa John’s garlic butter sauce. Lollipop wings: tasty with a nice amount of heat, and it was accompanied with a warm Roquefort sauce. Though I’m not gonna lie, I missed having whole buffalo wings because I think that the skin has a lot of flavor. Frickles: I’m not in love with fried pickles, but I do enjoy munching on them from time to time. What was great about these was that the pickle inside the batter still managed to stay crispy. High five. And then our entrees came. While I was stuffing my face with fries and wings and frickles, I was really thinking about my rib-eye steak. Is that considered cheating? I ordered the Cowboy Rib-Eye Steak, which is also known as a French-cut steak. Kind of disappointing because I wish I could have had all that meat that they cut off of the bone. Anyway, the steak was served with a generous pat of truffle butter on top and red wine mushroom sauce on the side (woohoo, I hate it when sauce is poured on). Under the thick cut of steak was a truffle spinach risotto. The steak was cooked to a perfect medium-rare, kudos to the cook. I took one bite and realized that I missed the fat. Then I took another bite and then a third bite and then I was all like, “Dude! Where’s my fat?” This was one of the leanest rib-eyes I have ever had before. After that third bite I crawled into a fetal position under the table and cried. OK. So maybe I didn’t, but a little part of me did die on the inside. To chefs everywhere, please refrain from trimming fat too much. I’d be perfectly fine if you didn’t touch it at all. The red wine mushroom sauce was decent, I appreciated that it was light and not overpowering. The star of the dish was definitely the risotto. Cooked to perfection, the rice was slightly firm and was oozing with so much cheese that you could see strings of it with each forkful I lifted off the plate. It was worth getting that dish to try that risotto. A colleague of mine was nice enough to give me a bite of his brisket po’ boy. It was a tasty sandwich, though slightly too sweet for my tastes. Dessert? Yes, the fried Oreos, please. Woohoo! I’m a huge fan of fried Oreos. It’s like a mini zeppole with a slightly melted Oreo in the middle, how can you go wrong? Well, Rare slightly veered off the course and topped the fried Oreos with ice cream and whipped cream. Now don’t get me wrong, I love ice cream and whipped cream, but I wish that they served it on the side. It made the batter on the Oreos soggy and not as enjoyable as they could have been. Did The Top Chef Master’s Restaurant Meet My Expectations? I’m addicted to Top Chef. Always have been, and I have a feeling always will be. I must say though, I love Top Chef Masters even more. All the dishes look amazing no matter what because the caliber of talent on this show is so high, and everyone is already so accomplished. I’m in complete awe of all the contestants. So can I just tell you how excited I was to be eating at Shang in downtown New York City? The chef of this Pan-Asian restaurant is Susur Lee. Not only was he a contestant on Top Chef Masters, but he even won one of the episodes. Susar has a ridiculous and celebrated background when it comes to cooking, just check out his Wikipedia bio. And judging from the episode, he looks like a really awesome guy to hang out with. I walked up an elegant flight of stairs to get to his restaurant and found myself in a beautifully decorated restaurant. Spacious booths, simple art and modern furniture. The interior design was much more pleasing than my overall dinner was though. For cocktails I sampled a Shang Caipirinha made with cachaca, fresh lime, lychee and tarragon. It was tasty and stayed true to the taste of a real caipirinha. My second drink of the evening was the Thai Lemonade that I asked to be served as a martini. Don’t think for a second that this was a sweet concoction. Made from gin, basil, lemon juice and black peppercorn that infuse the drink beautifully, it was a tart drink that I found very satisfying. 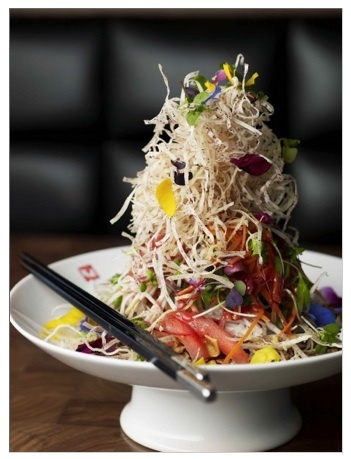 Singapore Slaw: a massive salad made from 19 ingredients, some of which were fried taro, peanuts, carrots and 3 types of microgreens. I’ve never tasted anything quite like this blend. While I’ve sampled similar dishes, the combination of all of these flavors was fantastic and very unique. I must mention that it was slightly overdressed and oily, but a must try. Sashimi platter: a complete let down. It was simply average and I really wish that my date and I didn’t order it. We didn’t even want to finish it. Beef satay with penang peanut sauce and chili mint chutney: As a whole it was good, but not amazing. Though I must mention that the beef was very tender, probably the most tender beef satay I have ever had. Cantonese wok fried pearl noodles with shrimp: This could have been a good dish, but something definitely went haywire. Eat bite of the shrimp felt as if I were take a shot of rice wine. The alcohol flavor was way too strong. We couldn’t eat anymore of the shrimp after a couple of bites. The noodles were nice and homemade, a bit chewy, but decent. Overall, I’m happy that I got to try Susur Lee’s restaurant, but I don’t plan on going back, let alone recommending it to anyone. For someone of his reputation I expected a lot more. We were so disappointed in our dinner that we didn’t even stay for dessert. One other downfall of the restaurant was the menu. Nothing on the dinner or dessert menu excited me and made me feel that I had to try it. It was a bit on the boring side. But then I went home and made myself a Jameson Manhattan to end my night on a better note. Woohoo, John Jameson and Son! Junkfood isn’t good for our health, nor is it high-end, but boy-oh-boy, it’s still considered a wonderful splurge sometimes isn’t it? My date and I had such a fantastic pig out night the other day, whoppers, nuggets and fries at Burger King, and then we trotted (yes, trotted) over to Baskin Robbins to buy an ice cream cake. After all, their website says “Cakes for Everyday Occasions” and splurge day is definitely an everyday occasion. I let my date choose and he went for the Oreo cake, which is a layer of chocolate cake topped with Oreo ice cream and frosting. He was in love. About a week later, my date was pining for another Baskin Robbins cake, but were trying to be financially responsible so I vetoed the idea. We did just go through a recession after all. After some calculations in my head, I realized that because I had eggs and sprinkles at home, I could make one for $9/$10. That’s around $20 cheaper than the store bought version. Off to the supermarket store I went. Keep the Cool Whip and ice cream in the fridge so that it softens. Since I didn’t need a whole cake, I only used 1/3 of the cake mix and baked according to the directions. You can use more if you want a thicker cake layer. The key here is to bake it in a springform cake pan. I used one that was around 9”. Also, since you are using less cake batter here, make sure to check on it every 10 minutes since it will cook faster than the time it says on the box. After the cake part is baked and cooled, open up the pan and pop the cake (with the cake pan bottom on it still) out. Take the saran wrap and loop it under the bottom of the cake pan and then take another piece of saran wrap and loop it perpendicularly to the first one. You want the saran wrap to be long. The idea here is that when you pop the cake pan ring back on the cake pan bottom, the saran wrap will line the inside of the ring and then fall over the edges. This will allow the cake to 100% not stick to the sides of the pan. After everything is popped into place, scoop the softened ice cream on top of the cake and smooth out so that it is an even layer. Then top the ice cream with the Cool Whip and smooth out as well. Sprinkle with sprinkles and pop into the freezer for 2 hours. When you take it out, pop the ring of the pan off and take off the saran wrap and voila! You have a $9 home made ice cream cake that is just as tasty as the store bought one. Izakayas are great when you are looking to get filled up without spending too much money. What is an Izakaya? Think of it as a Japanese version of an Irish bar that serves food. The food menus here are huge so you can probably go everyday for a month and get to try something new. One thing that I must make clear about this type of Japanese eating establishment. The food is never really amazing. If you are expecting Le Bernardin, please just go to Le Bernardin. It’s bar food at affordable prices, and not a fancy bar. Probably great food if you’re intoxicated, which is kind of the point I guess. I’ve always wanted to go to Japan, and I imagine that if I get to go, I will see this type of place littered on every block. They aren’t fancy restaurants. Remember this is just plain and simple bar food, just the Japanese version. 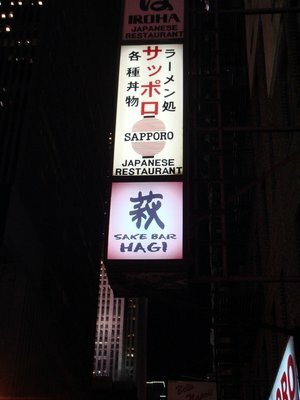 I usually go to the Izakayas on St. Marks, but a friend of mine suggested that we go to Hagi, one of her favorites. We ordered a large bottle of cold sake and so much food that even our waiter was in awe. Well he was either in awe or disgusted, I like to think it was the former. What I found the most amusing was that the tables around us saw all the food we got and kept pointing and ordering from our table, and they were Japanese!! I am honored. Sake- We got a very large and cold bottle. Think wine bottle size. Remember what I said in my mini sake lesson? Check back here if you don’t. They have a very large selection here, so unless you know a lot about sake, get a recommendation from the staff. Grilled smelt-Very snackable and came three to a skewer. Quite tasty. Assorted pickles-I love Asian ones, but these didn’t tickle my pickle. Sorry, I just felt like rhyming, heehee. Octopus balls-Typical Japanese street food and they made them very well. Think of a small round ball of cooked batter with a hidden piece of octopus in the middle. Spaghetti with cod roe cream-The pasta was cooked well and the cream sauce had flavor. Did I love it? No, but it’s bar food, if I were drunk I probably would have hoovered it. Large sardine filled with roe-This was one of my favorites of the night. I love roe and when it’s cooked it’s so flavorful and filling. When it comes to any seafood that has eggs in it like lobster, it kills me when people discard the eggs. They taste so good and are quite expensive if you think about it. Pork belly with bean sprouts and garlic shoots-People rave about this dish, I thought that it was just OK. I’m a huge fan of garlic shoots so I quite enjoyed that part of the dish. I wish the pork belly were a little more flavorful. My one main connection with this dish is that it reminds me of what my grandmother would cook for me when I was growing up and still does upon request, just with beef. That might be why I didn’t love it, granny probably makes it better. Will I be going back to Hagi? Yes, and it’s because they had one thing that completely blew my mind. It is one dish that I will be looking out for at other Japanese bars and if my friend hadn’t ordered it, I would have missed it on the extensive menu. So thank you friend! It was their fried pork belly. You must be a fan of fat in order to enjoy this dish, because otherwise you will hate it. And as you can see from my Minca post, I am a major proponent of it. The best way I can describe this plate is to think of each piece as a really thick potato chip, a few millimeters thick. The outside is so crispy and when you bite into the middle it is all fat. Pure fat. Heaven on a plate. Based on this one dish, I know that there must be other star dishes on their menu, I just have to find them. Maybe it’s their sashimi, maybe it’s the yellowtail collarbone or maybe the liver or chicken skin yakitori, but I can’t wait to try more to find out. These April showers have really been putting a damper on my mood. After working these 10 hour days I’m starting to feel a lot more lethargic than usual. Tonight I wanted something really homey to eat, but that didn’t take much effort. Luckily I found a can of sweet creamed corn in my cupboards and a potato. Corn chowder sounded about right. This is one of the easiest soup recipes that you will ever make, so easy that you will be able to commit it to your memory. 1 cup of milk or cream. I had half ‘n’ half in the fridge so that’s what I used. Boil the potatoes until they are almost cooked all the way through. You’ll know when you can stab a piece with a fork or knife and instead of breaking in half, it will snugly stay on your utensil. You will finish cooking it off later. Drain the potatoes and put aside. I use the same pot I cooked the potatoes in because, well, it’s one less pot I have to wash. Just make sure to rinse it out with water because the potatoes will have made it all starchy. 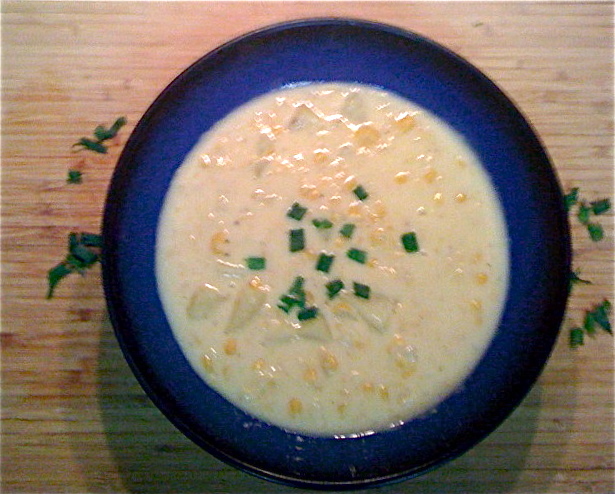 Pour in the can of sweet creamed corn, milk, salt, pepper, butter and bring to a boil. After it starts boil, put in the potatoes, cover and simmer it for another 5-8 minutes. Don’t forget to stir and scrape the bottom of the pot every couple of minutes because the corn can stick. Voila! You’re done. Eat just the way it is or garnish with fresh herbs like chives or scallions, stir in some cheese, add some bacon, clams, whatever you want. Think of it a base that you can use to make a variety of other soups. courtesy of dailymail.uk. Their's looks so lush, I couldn't resist the picture. My manicurist is starting to get really annoyed with me. 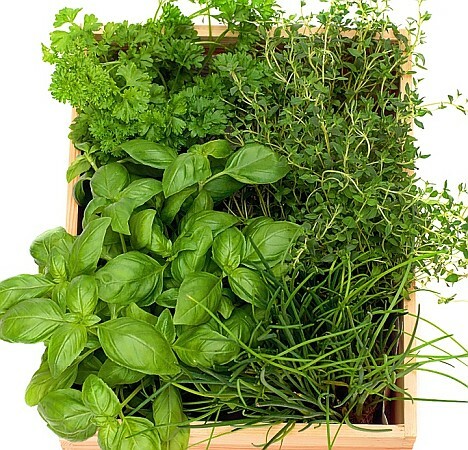 I always show up with dirt under my fingernails because I’ve been expanding my herb garden. Yes, sadly, I’ve reached that age where I felt the need to plant an herb garden. And even sadder, yes, my herb garden makes me happy. Growing up in queens, my grandmother always planted a beautiful garden. I grew up with stunning roses, gorgeous tulips, juicy peaches, sweet watermelon, pears, squash, cucumbers, tomatoes and god knows what else. Well I do know what else, but it’s too long to list. Though I must say, I guess I got my penchant for eating random berries from her, which really aggravates my friends because they always feel the need to stop myself from poisoning myself. I never got sick with my grandmother because she could tell which berries wouldn’t kill me, a habit I never picked up. Today, living in Manhattan doesn’t allow me the luxury of having a backyard. So a year ago, I decided that since I spent so much money buying fresh herbs, I might as well start my own windowsill garden. My first time around, I hit up the farmers market at Union Square and bought basil, parsley, cilantro, chocolate mint, rosemary, sage, spearmint, thyme, oregano and dill. I managed to kill half of them in six months. The other half fought for their lives and somehow managed to survive under my care. Not one to give up when it comes to food, last month I tried to replace my murdered plants and ended up at a lovely hardware store on the corner of 1st ave. and 6th str. in the East Village. I had originally been on my way to the farmers market again, but it was Sunday and they were closed, and this wonderful gentleman overheard me lamenting about herb plants and directed me to this store. After talking to a couple of the workers at the hardware store I learned a few things. 2) Use organic potting soil. At this hardware store it cost the same as non-organic soil. I could immediately see and feel the difference from the regular potting soil I had previously purchased. 3) Do not over water your plants. I was told to stick my finger an inch into the soil and if it still felt damp to leave it alone. Apparently the number 1 reason why people kill their herbs is due to over watering. With renewed enthusiasm I am glad to say that nothing looks like it is dying…knock on wood. I now have a windowsill full of basil, dill, cilantro, scallions (I replanted store bought ones, they regenerate), garlic (I took some leftover cloves and planted them in the dirt, they are sprouting amazingly), chives, mint, parsley, lemon thyme, sage and oregano. The lemon thyme smells like lemon drops! I might try rosemary again one day, but I’ve already killed two of them so my pride is slightly hurt. Oh! And if anyone has any advice about growing basil, please let me know. Mine are short and squatty like me, they never grow tall and full. Monkey bread is soooooooooo good. It gets its name because you are essentially baking balls of dough together and when you are ready to eat it, you are picking or pulling it apart, just like a monkey. This dessert has been making its rounds through different countries for god knows how long. Nancy Reagin even served it in the White House and it has become a Christmas tradition in certain families. While, like any recipe, you can make everything from scratch, I’m going to teach you my short cut version that is quick, easy and oh-so delicious. It tastes just like a Cinnabon! Traditionally a bundt cake pan is used, but since I don’t have one, I use any cake pan I have lying around. I actually prefer using a regular cake pan because each gets an equal amount of all the seasonings. Coat your pan in butter. Melt the rest of the butter and brown sugar together and set aside. Cut each piece of biscuit dough into 6 pieces. Put the sugar in a paper bag or a container that you can cover. Put in cinnamon and nutmeg to taste to make cinnamon sugar. Simply add to your liking. Make sure it is mixed well. Add a few pieces of biscuit at a time and shake in the cinnamon sugar. After each piece is coated well, place them in the pan next to each other. You don’t have to leave any space. After you have laid down each piece, pour the melted butter and brown sugar over it. Bake according to the directions on the biscuit can. Take it out and let it cool. When it has cooled down a little, melt the cream cheese frosting in the microwave till it melts, about a minute. Make sure that you take the foil off first! 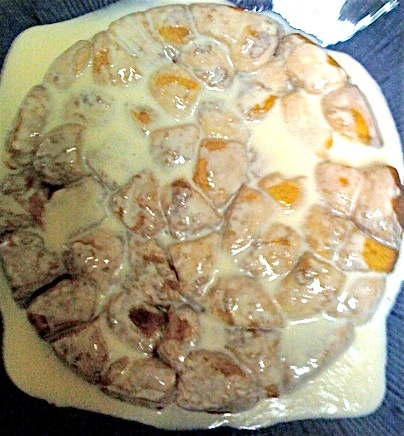 When it’s melted, pour it all over the baked dough and there you have it, yummy goodness. Serious yummy goodness! Eat it while it’s hot or after it cools down, either way it is fantastic. And don’t forget! You can make it a variety of different ways by adding raisins, nuts, by not adding frosting, by changing the frosting, etc. Food blog. Restaurant blog. Recipe blog. Please feed me blog. Subscribe To Please Feed Me!